In today's socio-political climate, it is not enough to simply have strong opinions or beliefs on the issues working against the humanity of this nation. We have witnessed for quite some time now how precarious beliefs can be and we have silently wept as we've watched those beliefs, the beliefs of an entire generation of people, fall on deaf and defiant ears. Yet, in the midst of this draconian epoch that has subsumed us, the most beautiful sight to behold is the proliferation of activism that has emerged in retort. As is historical tradition, this new wave of activism is being led by strong and fierce women--most of them women of color, who have been bred with the natural instinct to dissent whenever their existences are invalidated or devalued. 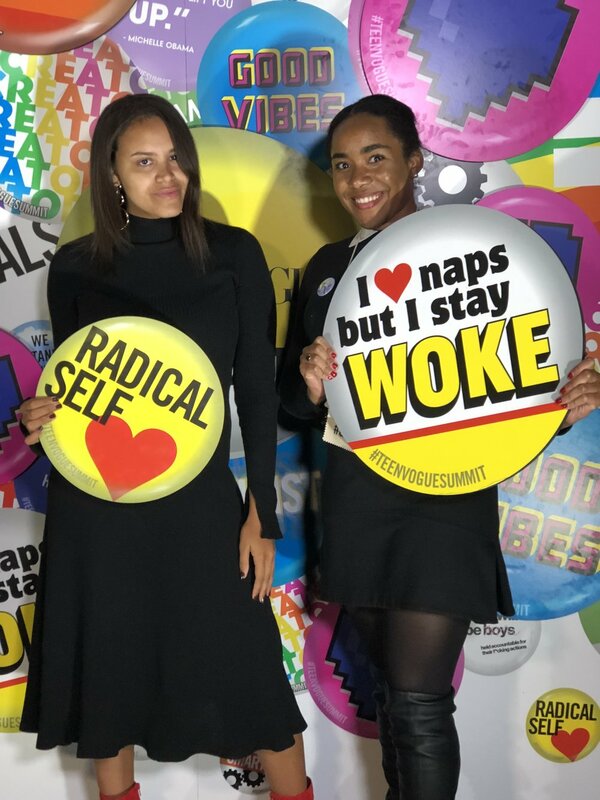 I recently had the opportunity to attend the first ever teen vogue summit, which was nothing short of a young activist's sanctuary filled to the brim with inspirational women. From the likes of Yara Shahidi to Hillary Clinton, all of the speakers were activists who spoke about the issues facing women and people of color in their respective industries. I was also pleased to find that the summit featured speakers with identities other than cisgender straight women. Speakers like Tyler Ford and Jessamyn Stanley provided poignant insights on what it means to navigate and defy the politics of a world that aims to define them by their sexual orientation or gender identity. All in all, these extraordinary women have succumbed to much scrutiny for expressing their opinions and standing up for justice, and yet have emerged all the better for it. When I tell you that these women--their presence, their brilliance, their resilience--brought me back to life, I am hardly exaggerating. I wanted to share a few soundbites that I gathered from the speakers with you all, in the hopes that they will clear up the clouds of self-doubt that may be fogging up your vision in 2017. It's 2018 now and #timesup. Its time to start speaking out on the issues that will not only impact you, but also the ones that will affect future generations. Check out the eight inspirational gems I captured below! "Don't bury your head. First you have to stand up; then you have to stand all the way out"
"Dont be grateful to be there--they should be grateful for you"
3. On the epidemic of perfectionism that is plaguing women..
"Girls are raised to be perfect, boys are raised to be brave. Because of this, boys are comfortable dealing with rejection and we aren't comfortable with it at all. We forget how to speak up for ourselves. Bravery is a muscle you gotta keep exercising." "First ask yourself this. Do you want to be integrated into a burning house? "By golly, Jim! I am SO glad you agreed with MY idea!" "Only work on things you're passionate about. Be selfish and self-loving. Say 'No'. Vulnerability is OK"
"There was no overnight for me. I went to college at NYU and studied film. I went to grad school and studied film. I graduated and I swept floors. I was one everybody's steps begging to be on whatever video I could get on. I interned and did what I could and then on the side I created my own videos until I had something to show and then, Beyoncé called..."
--Melina Matsoukas, Film Director and two-time grammy award winner for Rihanna's "We Found Love" and Beyoncé's "Formation" music videos. "IMPEACH 45, IMPEACH 45! Let's sing that song all over this country wherever we are. Let's talk about it in the workplace. Let's talk about it in our churches. Let's talk about it with organized labor. Let's get the people coming to the forefront. Every day in every way, IMPEACH 45! --Maxine Waters, U.S Representative for California's 43rd congressional district. Aaand these were only just a few of the gems I captured. Pretty inspiring am I right? If you've ever experienced failure, if anyone has ever made you feel that you don't deserve to be where you are because of who you are (whether its because of the college you attend, or the job that you have), if you've ever doubted your own abilities, I encourage you to pocket these soundbites, scribble them down in a notebook, or post them on your wall. Remind yourself daily that the universe put you exactly where you are for a reason; so, its your responsibility to let that reason be known. If you want to hear more about the summit, watch the official press release video below. You can catch me, Yours Truly, at 2:27 hanging at the Woke Lounge! Also check out the ABC interview of Elaine Welteroth, the youngest and first Black Editor-In-Chief of the magazine, speaking on the new direction and vision she has for Teen Vogue.